Downtown Bangor in the early evening. Bangor outranked Maine’s two other largest cities in a recent analysis by WalletHub comparing the business climates of 1,261 small cities around the country. Bangor ranked 434th out of 1,261 cities that the national finance website graded based on 16 key metrics, according to its 2017 list of the Best & Worst Small Cities to Start a Business. In doing so, Bangor outperformed Portland, which was came in at 448th, and Lewiston, which took the 525th spot. The metric upon which the cities were ranked included average growth in the number of small businesses, real estate and labor costs, the number of startups per capita, and access to capital, Wallethub said in announcing the rankings. Baldacci, who owns a small Bangor law firm, also noted that this marks the second consecutive year that Bangor has been ranked as a top city in Maine on a Wallethub listing. “I think it’s good information to get the word out to people that we are business friendly,” he said. 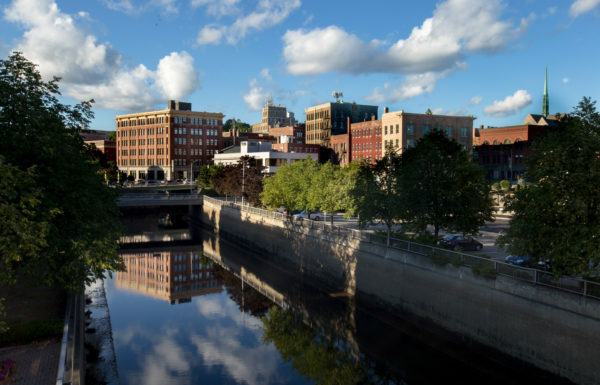 Last year, Bangor scored 60.06 on the organization’s list of the Best Small Cities in America list, placing it slightly ahead of Lewiston’s score of 60.36 and in front of Portland’s 64.7 score. Factors analyzed for that list, which looked at 1,268 small U.S. cities, included affordability, economic health, education, health, quality of life and safety.